One of the principles that brings me great comfort is knowing God doesn’t waste anything. God didn’t create the world and have leftover parts. Unlike myself! When I assemble something, I invariably have parts left over… at least an extra nut or bolt, but this is not the case with God. He does all things perfectly, and on my best day, I am a long way from that standard. What is significant to me about this is the statement it makes about the difficult, disappointing, and even bad aspects of my life. Those times are not wasted time either. Consider for a moment what the scriptures have to say about the various aspects of our lives, even the tough times. Romans 8:28: “And we know that God causes all things to work together for good to those who love God, to those who are called according to His purpose." These wonderful verses assure us that even the most difficult and painful aspects of our lives are not wasted. Trials and tribulations are never easy, but God uses them to perfect our faith and character. Afflictions are painful, but God not only brings comfort, He uses those experiences in our lives for us to help others going through similar circumstances. The pain and loss we experience, God uses to enable us to be vessels of His comfort and ministry to others. 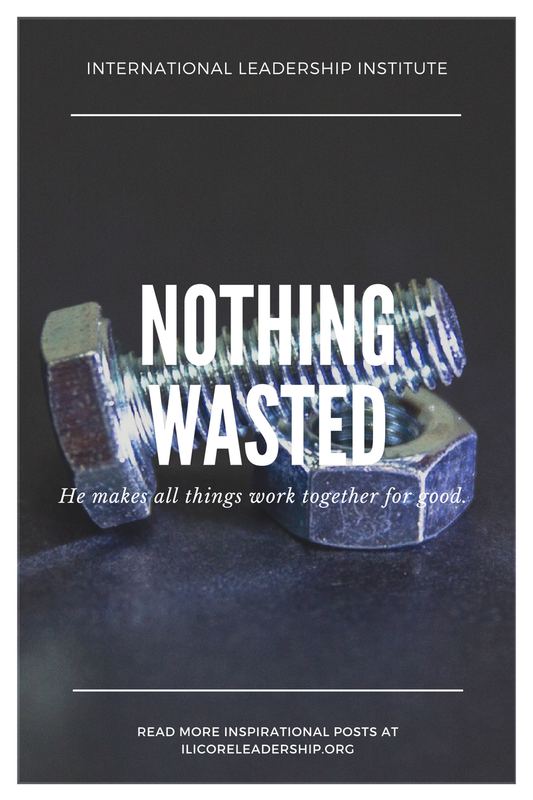 In God’s economy, NOTHING is wasted. One of my favorite names for Jesus is “Redeemer.” It reminds me of how we used to save “green stamps” when I was a boy. The stamps were not really worth anything, but you could take them to what was called the Green Stamp Redemption Store, and redeem them for all kinds of things. These days it is like winning tickets at an arcade, you can trade them in for candy, toys, or stuffed animals. It is the practice of trading something without any real value and exchanging it for something that has real value. That is what redemption is! When the Redeemer redeems us, the brokenness of our lives is exchanged for something of eternal value. Every difficult, painful circumstance, every trial and tribulation, every grief and loss, are all used by God in our lives and sometimes even in the lives of others. He uses these things for good, taking that which is hard and even bad, and redeeming it all for our benefit and for His purposes and His glory!